A day of local exploration with another gorgeous beach at Achmelvich. After a lot of searching we found the Hermits Castle folly on the outcrop near the beach. A late tea at the Lochinver Larder with their world famous pies and fresh langoustines - such good value. Pure white sands, an empty beach and seals happily and inquisitively circling within meters of the shore. A beached yellow kayak in the foreground caught our eye. We set off in this direction in pursuit of an architectural folly to no avail. Turning, we tried the other end of the beach and eventually found it. Tucked away on a rocky standing was the Hermits Castle an in-situ concrete folly constructed in 1950. shortly after completion it was abandoned and the glass windows and door have long gone. 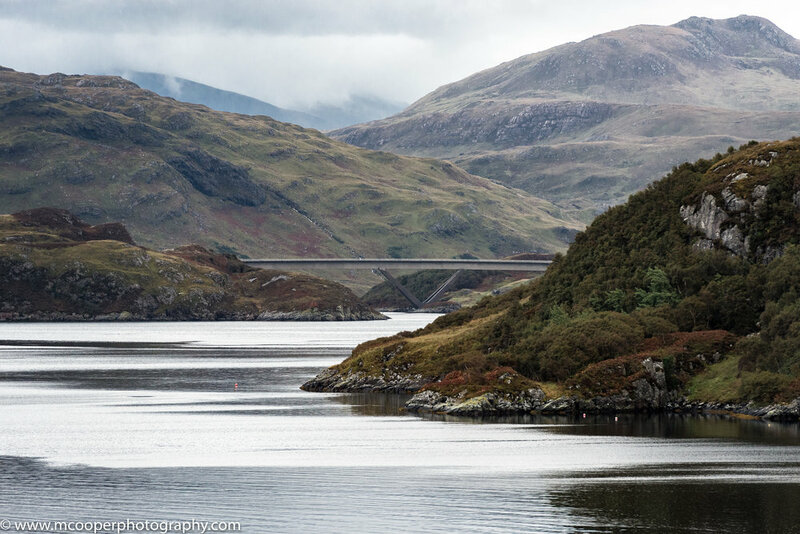 There is something about a boat on a tranquil loch that I can't resist photographing. This was on our way round from Drumbeg - clockwise - it can be trickier than the Applecross pass in places! I'd been told this was a scenic area and I'd seen lots of pictures of the bridge but not from this angle before. The supports just seemed to follow the landscape - nicely engineered.